The world is facing an acute misuse of talent by not acting faster to tackle gender inequality, which could put economic growth at risk and deprive economies of the opportunity to develop, according to the World Economic Forum’s Global Gender Gap Report 2016, which is published today. Behind this decline are a number of factors. One is salary, with women around the world on average earning just over half of what men earn despite, on average, working longer hours taking paid and unpaid work into account. Another persistent challenge is stagnant labour-force participation, with the global average for women standing at 54%, compared with 81% for men. The number of women in senior positions also remains stubbornly low, with only four countries in the world having equal numbers of male and female legislators, senior officials and managers, despite the fact that 95 countries now have as many – if not more – women educated at university level. In 2015, projections based on the Global Gender Gap Report data suggested that the economic gap could be closed within 118 years, or 2133. However, the progress has reversed since then, having peaked in 2013. With women on average benefiting form only two-thirds of the access to health, education, economic participation and political representation that men have, a number of nations are emerging to challenge the traditional hegemony of the Nordic nations as the world’s most gender-equal societies. While the leading four nations are Iceland (1), Finland (2), Norway (3) and Sweden (4) – with Finland overtaking Norway – the next highest placed nation is Rwanda, which moves one place ahead of Ireland to 5th position. Following Ireland, the Philippines remains unchanged at 7th, narrowly ahead of Slovenia (8) and New Zealand (9), which both move up one place. With Switzerland dropping out of the top 10, 10th position is taken up by Nicaragua. Elsewhere, the United States (45) loses 17 places since last year, primarily due to a more transparent measure for the estimated earned income. Other major economies in the top 20 include Germany (13), France (17) and the United Kingdom (20). Among the BRICS grouping, the highest-placed nation remains South Africa (15), which moves up four places since last year with improvements across all pillars. The Russian Federation (75) is next, followed by Brazil (79). India (87) gains 21 spots and overtakes China (99) with improvements across Economic Participation and Opportunity and Educational Attainment. Countries from Western Europe – including the three largest economies, France, Germany and the UK – occupy 11 of the top 20 positions in the Index. 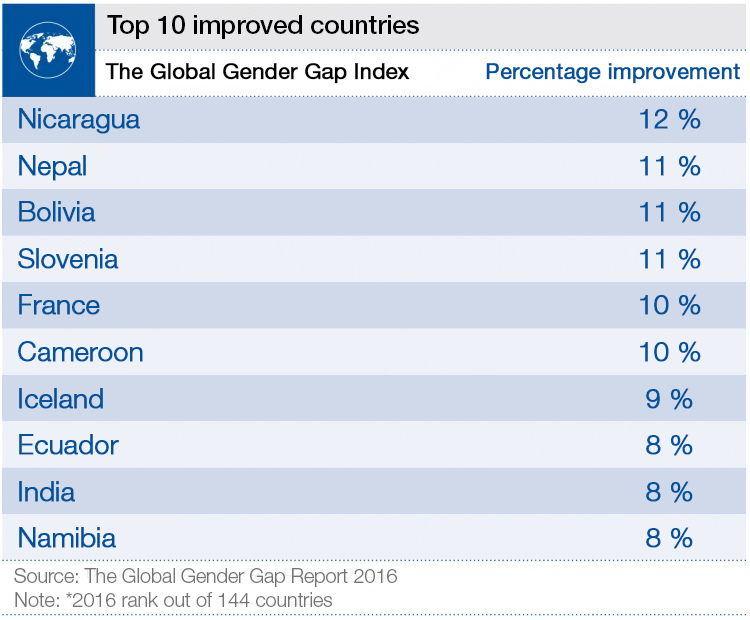 While some countries have clear room for improvement (Italy drops 8 places to 50; Greece drops 5 to 92), it has now closed 75% of its gender gap, more than any other region. At the current rate, it could expect to close its economic gender gap within 47 years. After Europe and North America, the region with the third narrowest gender gap is Latin America and the Caribbean. With 70% of its gap now closed, it boasts six countries to have fully filled both their education and gender gaps, more than any other region. It can also be expected at the current rate of improvement to have closed its economic gender gap within six decades. With Nicaragua the only country in the top 20, however, the performance of the largest economies – Argentina (33), Mexico (66), Chile (70) and Brazil (79) – is mixed. 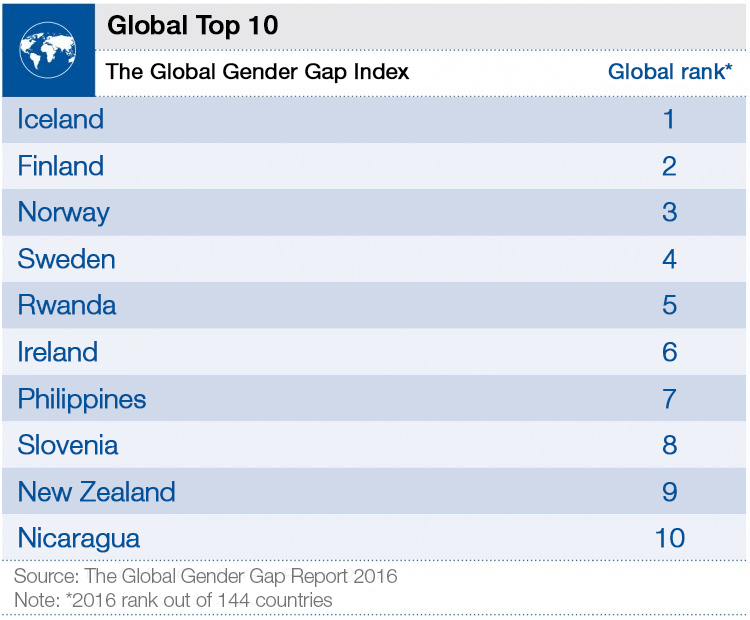 East Asia and the Pacific follows next, having closed 68% of its gender gap. This is a region of stark contrast, with a large distance between the most gender-equal societies such as the Philippines and New Zealand and economic heavyweights China (88), Japan (111) and Korea (116). The sluggish pace of change in these larger nations in part explains why current projections suggest the region will not close its economic gap for another 111 years. The lowest placed region – having closed 60% of its overall gender gap – is the Middle East and North Africa. With only Israel (49) in the global top 50, the next highest in the region are Qatar (119), Algeria (120), the United Arab Emirates (124). Like South Asia, progress in addressing economic inequalities has been too slow and will not be closed for a further 356 years at today’s rate. Nevertheless, it is home to some of the most improved nations since 2006 on economic participation, including Saudi Arabia, Bahrain and Yemen. “These forecasts are not foregone conclusions. Instead, they reflect the current state of progress and serve as a call to action to policy-makers and other stakeholders to double down on efforts to accelerate gender equality,” said Saadia Zahidi, Head of Employment and Gender Initiatives, and Member of the Executive Committee at the World Economic Forum. Index scores can be interpreted as the percentage of the gap that has been closed between women and men, and allow countries to compare their current performance relative to their past performance. In addition, the rankings allow for comparisons between countries. Thirteen out of the 14 variables used to create the index are from publicly available hard data indicators from international organizations such as the International Labour Organization, the United Nations Development Programme and the World Health Organization, and one comes a perception survey conducted by the World Economic Forum. In addition to benchmarking gender gaps through the Global Gender Gap Report series and other topical studies, the World Economic Forum’s System Initiative on Shaping the Future of Education, Gender and Work aims to ensure that talent is developed, nurtured and deployed for maximum benefit to the economy and society by mobilizing business, governments and civil society leaders to rethink education, close skills gaps, accelerate gender parity and boost employment.